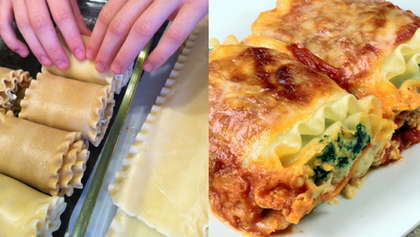 It's time to roll up your sleeves and create the classic Italian dish with a twist! It'll soon become a dinnertime favorite! Add mushrooms, spinach and 3 garlic cloves. Sauté 5 minutes or until onion is tender. Remove from heat and stir in cheeses, 2 tbsp basil, salt, pepper, and red pepper. Place cooked noodles on flat surface; spread a few tablespoons of mixture along the length of each noodle. Roll into a roll placing seam side down in a shallow baking dish. Pour sauce over the rolls, cover with foil, and bake at 350 degrees for 18-20 minutes until bubbly. Remove from oven and top with grated cheese if desired.